Jeb Bush wants to end food stamps. 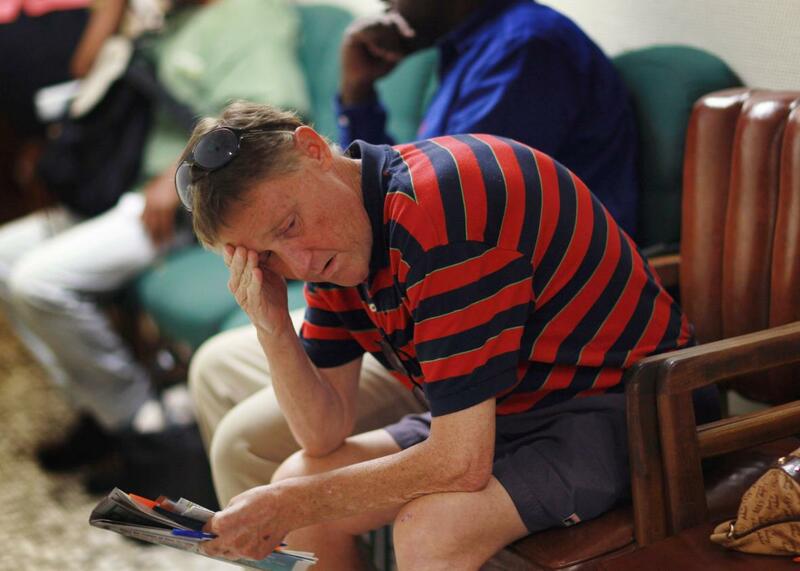 A man waits to apply for food stamps at the Cooperative Feeding Program on Feb. 10, 2011, in Fort Lauderdale, Florida. Jeb Bush, currently the most loathed candidate by conservatives in the GOP field, is hoping to shove his way back into their good graces by alienating the 46 million people who rely on federal food stamps to feed themselves each year. The former Florida governor on Friday unveiled his outline for how he’d overhaul the U.S. welfare system, and at the top of his list was bringing an end to the Supplemental Nutrition Assistance Program. Jeb says he won’t stop there, either. He also wants to kill a number of other welfare programs, including the Temporary Assistance for Needy Families, which helps pregnant women and families pay for such luxuries as housing and heat. “These programs may temporarily alleviate need,” Bush wrote, “but they trap families in perpetual poverty.” Translation: Poor Americans will do more for themselves if their government does less for them. What goes unsaid in Bush’s proposal—as it did in Ryan’s—is that by ending SNAP as an entitlement program, it would almost certainly mean more Americans would go hungry even in a near-perfect world where each and every state was able to spend the federal cash more effectively. That’s because Jeb is asking the states to do more while knowing the federal government will ultimately give them less. Under the current setup, anyone who qualifies for SNAP benefits receives them, regardless of how much money Washington has already spent on food stamps that year. But switching to a block grant would set a cap on spending by stopping the program from automatically increasing along with need. That could leave it unprepared and underfunded when the next economic downturn sends more Americans than expected scrambling to put food on the table. Meanwhile, history suggests that even if conservative budget hawks didn’t chip away at the program’s funding, inflation would slowly but surely do that job for them. That’s exactly what happened to TANF during Washington’s last attempt at major welfare reform. Since that program was block-granted in 1996, funding has remained steady at about $16.6 billion per year while the program has quietly lost nearly one-third of its spending power. The political payoff, though, is clear: It will allow Bush to tout the budgetary savings without having to claim responsibility for what those numbers mean in the real word. His proposal, after all, doesn’t end government assistance for the poor. It just leaves that job to the states, which is something a lot of conservatives can get behind.